This article first appeared in The Edge Financial Daily, on November 16, 2015. 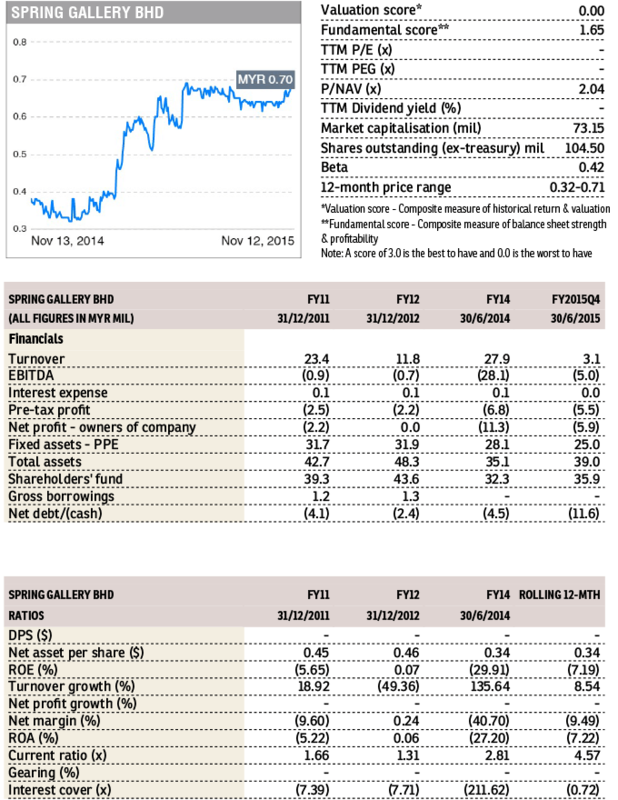 Spring Gallery (SGB) (Fundamental: 1.65/3, Valuation: 0/3) closed 0.5 sen or 0.7% higher at 70.5 sen last Friday on heavy volume. On Thursday, the company has been appointed by HV Muhibbah Sdn Bhd as a managing contractor for the development of a 3-storey shopping complex and a 12-storey hotel building in Kemaman, Terengganu. The development has a contract value of RM147 million. This was the second Southern City contract it had secured from HV Muhibbah. In July, SGB was appointed as a managing contractor for the development of an 18-storey apartment worth RM75 million. SGB, formerly known as PFCE Bhd, is involved in the manufacturing, trading and exporting of ceramic garden ware and household pottery items. Export, mainly to the US, accounted for 94.1% of its FYJune2015 revenue. For FY2015, the company recorded a net loss of RM1.4 million on the back of RM23.0 million in revenue. The loss was mainly due to impairment losses of RM2.9 million.